Two weeks have passed since the legislative elections of June 7 marked a major shift in the recent history of Turkey. The Islamist Justice and Development Party (AKP in Turkish), headed by President Recep Tayyip Erdoğan, lost its parliamentary majority, declining to 258 out of 550 seats. Opposition parties of the left and right profited from AKP's setback. The secularist Republican People's Party (CHP), in the first category, rose to 132 members. The ultra-right Nationalist Movement Party (MHP), with an ugly history of political and ethnic violence under the name of the "Grey Wolves," nonetheless elected 80 deputies, an increase of 29. 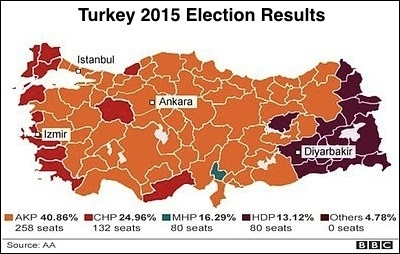 But the wonder of the polls was the emergence of the People's Democratic Party (HDP), a coalition of Kurds, secularists, leftists, heterodox Alevi Muslims, and former supporters of the AKP, with 80 lawmakers. In the aftermath of the unexpected news, commentators in Turkey and abroad are waiting, generally in silence, to see how events will play out. For the first time since it took power in 2002, the AKP would have to rule in a coalition. That is a cause for celebration within democratic opinion on the Bosphorus. For the first time since it took power in 2002, the AKP must govern in a coalition. Erdoğan campaigned aggressively for the AKP, wielding his polemical scimitar against the Kurdish and Armenian minorities, gays, and critical media. His general message was anti-Western. The choice was put forward clearly: you are with Erdoğan or with the "enemies of Turkey." When Erdoğan was elected president last year, he claimed he wished to be president for all Turks. But that was a bluff. In power, he has polarized the country, leading to, among other events, the explosion of two bombs at an HDP meeting in Diyarbakır, a city in eastern Anatolia with a large Kurdish population, two days before the vote. Three people died, and hundreds were injured. The Kurds will not forget this. It is a new scar on their collective memory. But the Kurdish role in the come-down of Recep Tayyip Erdoğan and the AKP involved much more than electioneering by a new party. Many Turkish citizens and residents abroad - who have the right to vote - were disgusted by the conduct of the AKP regime during the battle for Kobane, on the Turkish-Syrian border. Kobane had been seized by the genocidal marauders of the so-called "Islamic State," and was liberated in January 2015, after about four months, by Kurdish militias and the Free Syrian Army, coordinating with U.S.-led coalition air power. During the dramatic contest, Turkish forces stood on the country's border, refusing to assist the anti-ISIS forces and even turning back some refugees from Syria. These actions told the world that Erdoğan sympathizes with ISIS, or, at least, prefers them to the Kurds. Kobane may have tipped the electoral scales against him. The AKP regime's conduct during the battle for Kobane may have tipped the electoral scales against Erdoğan. Erdoğan's career at the summits of power began hopefully. In 2002, AKP stood for collective betterment, and a Turkey worthy of pride. "We live in a repressive and totalitarian system" - those words were pronounced then by Erdoğan, not by any subsequent protestors against his self-aggrandizing style. But he had not yet gained the control he sought. His vision for Turkey ended up centered only on security for his command. For years, the Turkish television networks run by the AKP have yelled "Yeni Türkiye!" - a "new Turkey" was coming. Erdoğan and his prime minister, Ahmet Davutoğlu, also praised "Büyük Türkiye" - a big and strong Turkey. This Turkey was to be defined by "güç" - power. AKP propaganda in the latest elections shouted "Tek millet! Tek millet!" - "One nation!" HDP leader Selahattin Demirtaş stood out if only because he did not shriek during his speeches. Erdoğan projected a great and powerful Turkey, obliterating all enemies, terrifying all critics, with a long arm reaching where the Ottomans once ruled, and beyond: in the Middle East and in the Balkans, and even in Central Asia. The neo-Ottoman fantasy remains intact. The new sultan will break the "hands" of the conspirators against him. Everybody is categorized: all must serve the state and suppress their doubts. Others are "terrorists," "blasphemers," and, of course, enemies of public welfare. A "New Turkey" is in birth, but it is not the one of which Erdoğan dreams. Nevertheless, something bigger has emerged before the surprised Turkish public. A "New Turkey" - "Yeni Türkiye" - is truly in birth, but it is not the society of absolute power of which Erdoğan dreams. Something new is visible in Turkey: fairness, mutual understanding, a balance of interests, and gentle speech. The president wanted to reinvent Turkey. If anybody now has such a chance, it is the People's Democratic Party (HDP). With its delegation of 80 legislators, the HDP can prevent Erdoğan from dismissing the Kurdish conflict. But coalition-making will not be easy. Neither the "Republican" CHP nor the HDP on the left will join easily with the "fascist" MHP; nor will the latter quickly gain a partner in the AKP, notwithstanding their ideological similarities. The CHP is discredited and its leader, Kemal Kılıçdaroğlu, has been reduced to a nullity. Erdoğan cannot apportion power, and Turkey may be in for more trouble. 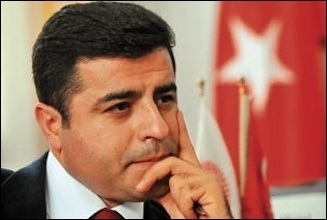 Selahattin Demirtaş of the HDP led his new alliance to overcome the 10 percent vote requirement imposed by the military in the 1982 constitution to exclude Kurdish representation in parliament. Demirtaş has caused a sensation, and is celebrated like a pop star. He is a human rights lawyer, aged 42, from Diyarbakır, and ran for the presidency against Erdoğan last year. Erdoğan defames Demirtaş as a "terrorist" and "un-Islamic." These allegations have failed. Demirtaş is often called falsely "the Kurdish Obama" if only because his demeanor is different from that of other Turkish politicians, just as the HDP is different from other Turkish political parties. Demirtaş is seen on television making breakfast for his wife and daughters. He speaks clearly and articulately without hiding his Kurdish accent. In his sole appearance on CNN Türk he brought the traditional stringed instrument known as the saz, which is popular with the Shia-Sufi Alevi minority that includes numerous Kurds. He sang an old tune in a plaintive voice. The HDP chief has charisma and authority that seems much more authentic than that of the egomaniacal Erdoğan. When the previously-mentioned Diyarbakır bombings occurred, Demirtaş called for calm among his supporters and a protest against violence at the ballot boxes, not in the streets. Meanwhile, the MHP and CHP, the rivals to the HDP in opposition, claim they can solve new challenges with old solutions. If the Turkish parties cannot produce a ruling coalition, a new election will be held. Disaffected AKP voters - Anatolian peasants, beneficiaries of pension benefits and other reforms - could return to the party's fold. In addition, Abdullah Gül, replaced in the presidency by Erdoğan in 2014, could assume a new role. Above all, Turkey is not Russia and Erdoğan is not Putin. While some observers compare the HDP with the leftist Syriza party in Greece, the HDP is not driven by such extreme social issues or ideological forces. The Turkish election showed that autocrats, who appear in the ascendant worldwide, may stumble. Plans for a burdensome presidency have been abandoned in Turkey. Indecision about the future government contributes to political anxiety. Yet a Turkey that is Muslim and Christian, modern and traditional, European and Asian, religious and secular, and with a place for its Kurds, has arrived on history's stage. It merits new respect.